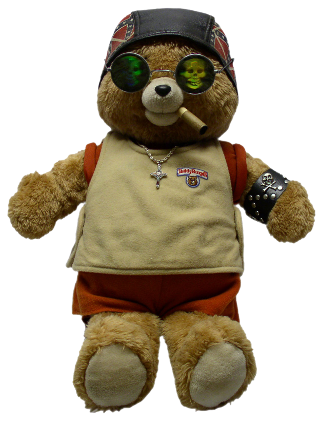 Well, now you know what happens to Teddy Ruxpin when he hangs out at the local bike shop for too long! These are two of the Ruxpins that I currently own along with his friend Grubby. The other two cannot be	shown here due to the extremely graphic nature of the images - they are only going to be used as parts to repair other Ruxpins. Luckily, they had signed their organ donor cards before they passed away! 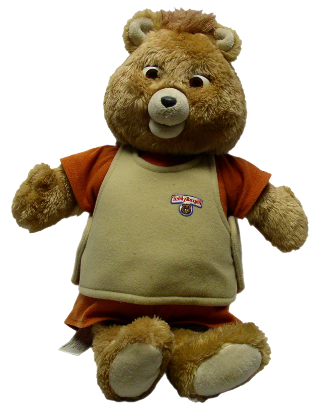 The Bad Boy Ruxpin here is the second generation model with a plastic backing plate on the cassette mechanism and three servo motors. 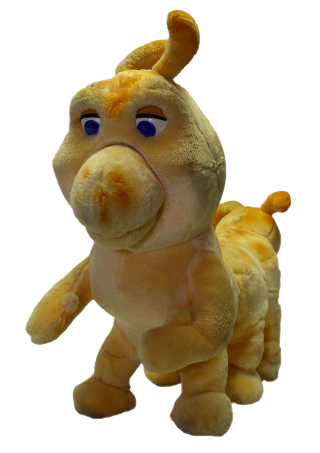 The Good Boy Ruxpin is a third generation. He also has a plastic backing plate, but only uses two servos. Both are now fully operational. Grubby doesn't have a cassette deck of his own, although he does require four D-size batteries of his own. 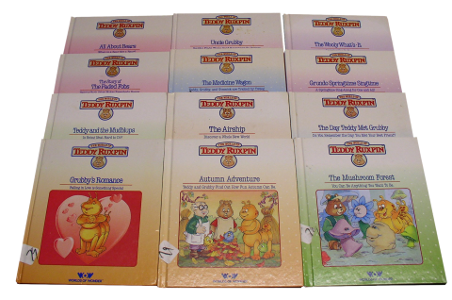 When connected to Teddy Ruxpin's auxiliary port (with a rare, proprietary cable), Teddy and Grubby read stories together and carry on a conversation. Unless someone has a spare cable, these guys are just going to have to communicate through telepathy for the time being! We just acquired two of the WoW/Playskool Ruxpins, but as usual, we have no way to test them. Instead of using normal cassette tapes like the original full-size models did, these later incarnations use a cartridge-style cassette that operates similar to an 8-track. The cassettes are recorded with the audio track on the left channel and the animation control data recorded on the right channel. This data is encoded in an eight channel digital proportion type system using groups of nine pulses separated by silence. 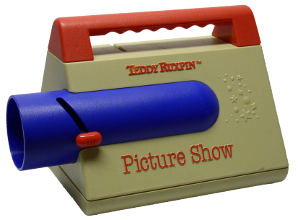 It's the length of this spacing that determines the individual aspects of Teddy and, if connected, Grubby and the Picture Show. The first channel is unused. 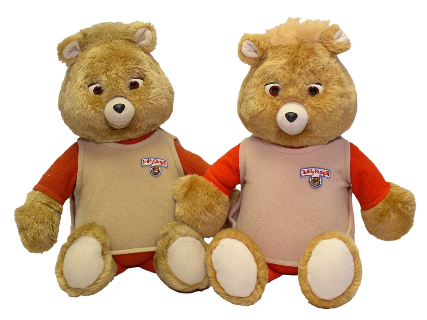 Channels 2, 3 and 4 control Teddy's eyes, upper jaw and lower	jaw respectively. The fifth channel determines whether the audio is routed through	Teddy, Grubby or both. 6, 7 and 8 are used to control Grubby's eyes, upper jaw and	lower jaw. There are holes on the top of the cassette housing near the center that indicate that the tape being played is a Ruxpin cassette with data encoded on it. On standard audio cassettes, these holes would align with the Type selection switches and would select a High Bias Metal position. If these holes are not present, then the circuit ignores the right track, playing it as standard audio instead of trying to decode it - which would cause the Ruxpin to malfunction.